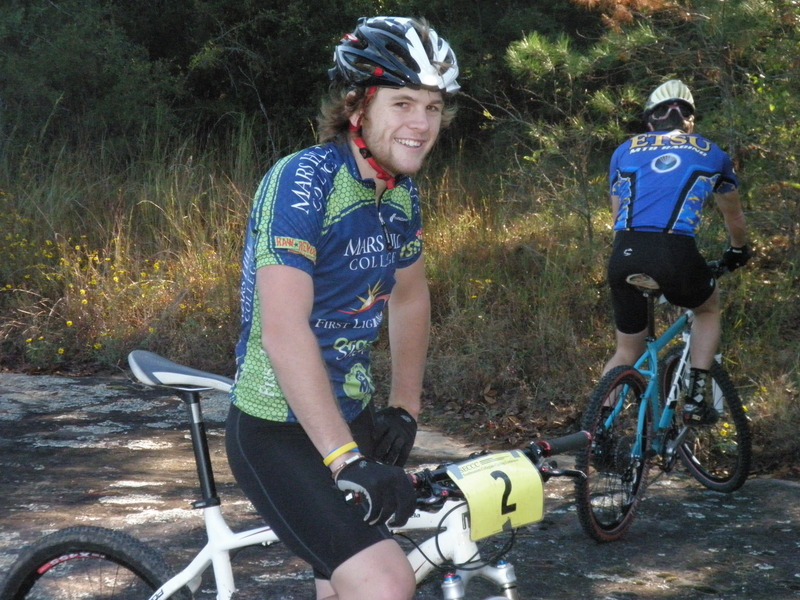 After track and mountain bike nationals, Mars Hill is now the 2nd ranked team in the nation. Congratulations to Cumberland University–friends in the Southeastern Conference–for claiming the top spot. Mars Hill's Matt Willing takes the early lead. 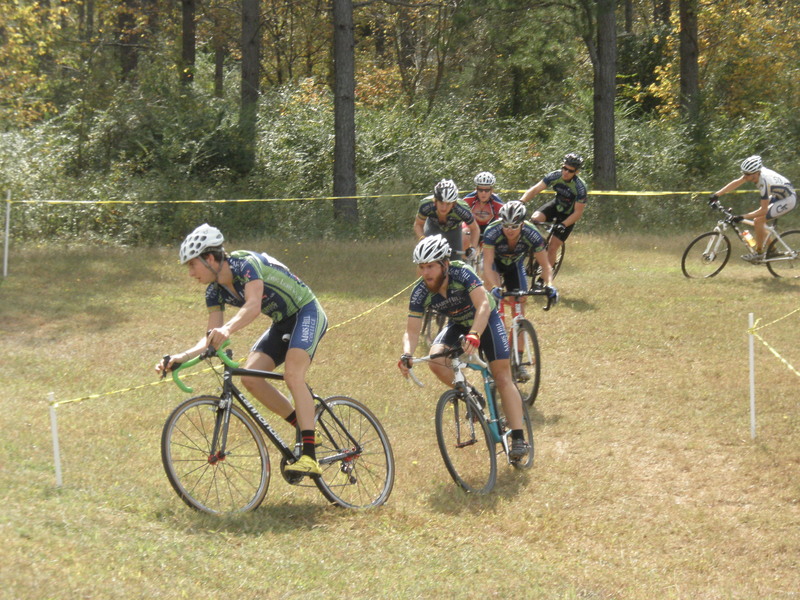 Clemson University hosted the first of this season’s six Southeastern Conference cyclocross races today on a constantly challenging course around Nettles Park. Clemson, King College, and Georgia Tech all sent large teams, making the event a great kick-off for the inaugural SECCC CX season. 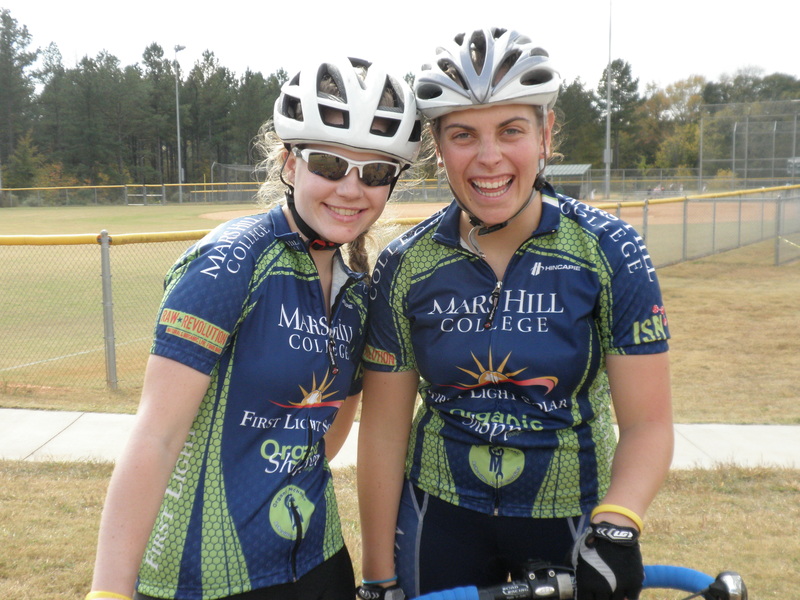 MHC riders arrived early to race their category races before the collegiate races later in the afternoon. In the category 3 race, Tim Jenkinson placed 2nd in his first cyclocross race ever, overcoming a mechanical early in the race. In the Pro/1/2 category race, Matt Willing, Paul Webb, and Kyle Knott represented MHC well by placing 2nd, 3rd, and 4th. Eric Muehl of Asheville won. In the collegiate men’s race–the largest field of the day–MHC’s top three men from the earlier pro race finished in the same order as before. Webb had a flat on an early lap and had to run his bike to the pits to receive a new wheel and had to give up 2nd place to a deserving Clemson rider. The men’s race finished with Matt Willing taking the win, Paul Webb in 3rd, Kyle Knott in 4th, and Tim Jenkinson in 5th. Steven Bryan from MHC finished within the top 10. In the women’s event, Klara Rossouw took the early lead and never gave it up, although a hard-charging woman from Clemson made the last lap an exciting finale. MHC’s Stephanie Bunnett finished 3rd. Stephanie Bunnett and Klara Rossouw mug before their first CX races ever. While the team expected last year’s CX team of Willing, Webb, and Knott to perform well, it was equally exciting to see four new cyclocrossers on the team starting off the season doing very well. In addition, we look forward to Yolanda Colon joining us for both cyclocross races next weekend at King College in Bristol, TN. See photos from the event on our Facebook page. Thanks to our supporters for helping us get to the races! This year mountain bike nationals was once again held at the Northstar-at-Tahoe resort outside of Truckee, California. Northstar provided some excellent and challenging courses at altitudes of 6500 to 8000 feet. The first event was the longer cross country event, which consisted of multiple laps of a six mile course. The first half of the course was basically up the mountain, the second half back down and through some technical rocky sections. Klara Rossouw started the women’s championship race strong and after completing three laps finished an excellent 6th place, just one spot off of the podium. Tim Jenkinson flirted with the top 15 in his championship event and eventually finished a respectable 26th after succumbing to the altitude on the fourth and final lap. The short track event was held the next morning on a 2-3 minute course that comprised a steep gravel climb, wooded singletrack, a slalom-like descent, and a concrete section through Northstar Village. It was a challenging course for the riders and a great one for spectating. In the women’s championship event, Klara again started strong and moved up into 3rd place before finally finishing on the podium in 4th. Tim had a great ride in his race to finish 14th. Later in the day, Klara raced the mountain cross event, a steep downhill course with huge berms and big jumps. After qualifying in 11th for the quarterfinals, Klara finished 3rd in her first bracket and didn’t move on to the semis. But she put in an excellent effort riding a hardtail cross country bike down a pretty sick course. At the end of the weekend, MHC finished in 11th place as a team. Not bad for a two person team. The 11th place points we earned vaulted the team’s overall national ranking from 8th to 2nd, just one point shy of 1st place, which is held by SE Conference rival Cumberland University. 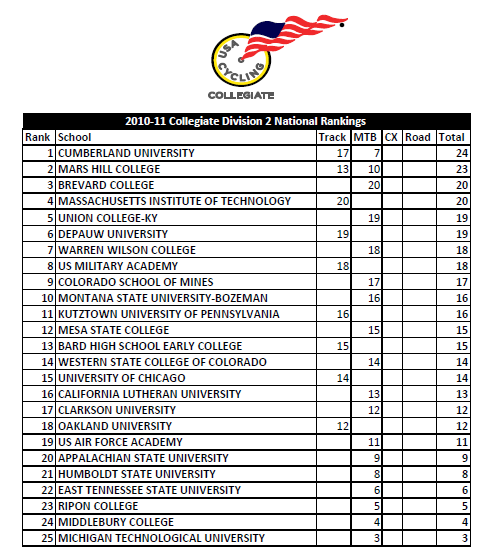 The national ranking is determined by adding a team’s points from each national championship discipline: track, mountain, cyclocross, and road. With the team’s strongest disciplines–cyclocross and road–still ahead, we’re going to try to claim that top ranking in December after cyclocross nationals. Looking ahead to next year’s mountain bike championships, the team plans on bringing a much larger squad to the event. We expect mountain bike nationals to be on the east coast next year, so this will make travel and logistics easier too. And with two freshman leading the team, it’s likely there will be quite a few more podium finishes in the future. Thanks to the team’s sponsors for supporting our efforts to be the best in the nation. Freshman Tim Jenkinson qualified for nationals in his first attempt. Freshman Klara Rossouw placed 5th overall in the Southeastern Conference women’s A category and will represent Mars Hill at nationals. Tim Jenkinson, also a freshman, qualified for nationals via strong and consistent racing and will make the trip to Tahoe too. Maitland Jones and Matt Willing both rode to consistent podium finishes in the men’s B category. Although experienced on the road and in cyclocross, both were new to mountain biking. Maitland ended the season as the top ranked short track racer. Marco Liubenov joined the team as its first gravity rider and competed in downhill and dual slalom events, placing 3rd and 2nd overall in the men’s C category. 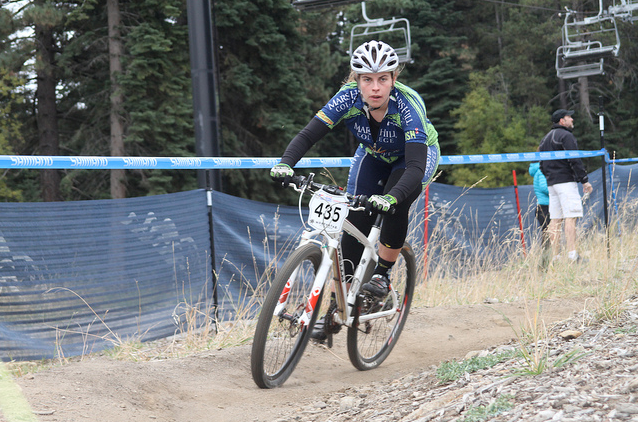 Steven Bryan raced to a number of podium finishes in the men’s C category in cross country and short track events. Paul Webb started off the season with strong results at ETSU but fractured his elbow during training and had to sit out the rest of the season. Paul will seek redemption during the upcoming cyclocross season. Full results from the weekend are here. And final points tabulations can be found on the conference website here. Stay tuned for a report from Mountain Bike Nationals….